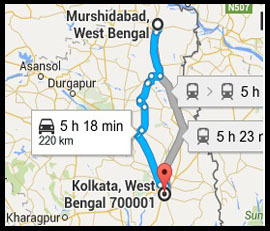 Murshidabad district (Bengali: মুর্শিদাবাদ জেলা) is a district of West Bengal, in eastern India. Situated on the left bank of the river Ganges, the district is very fertile. Covering an area of 5,341 km² (2,062 sq mi) and having a population 5.863m (according to 2001 census), it is a densely populated district and the ninth most populous in India (out of Baharampur town is the headquarters of the district. 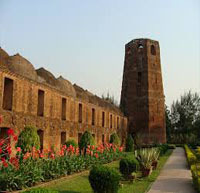 The Murshidabad city, which lends its name to the district, was the seat of power of the Nawabs of Bangla. All of Bengal was once governed from this town. A few years after Nawab Siraj-ud-Daula lost to the British at the Battle of Plassey, the capital of Bengal was moved to the newly founded city of Calcutta. It borders West Bengal's Malda district to the north, Jharkhand's Sahebganj district and Pakur district to the north-west, Birbhum to the west, Bardhaman to the south-west and Nadia district due south. The international border with Bangladesh Rajshahi Division is on the east.